HPC High Power Cable | Light Guide Optics | レーザー機器　専門商社｜株式会社アルクゥズ　ALQUZE Inc.
For a maximum power transmission of up to 600 W CW. 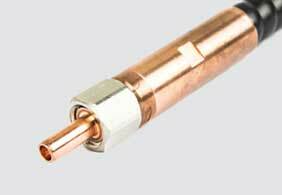 The LGO HPC cables are suitable for a maximum power transmission of up to 600 W cw. The connectors we assemble are compatible to established systems which exist in the market. Furthermore, our fibers are protected by a metal tube with plastic coating from environmental influences. Individual high power applications differ significantly from each other in terms of in-coupling, cooling requirements and wavelength. The cable has to fulfill these requirements. In such cases we ask for a comprehensive specification. Standardized lengths up to 20 meters and more are available. Other core diameters on request.